In this paper, we present a systematic way of deriving (1) languages of (generalised) regular expressions, and (2) sound and complete axiomatizations thereof, for a wide variety of systems. This generalizes both the results of Kleene (on regular languages and deterministic finite automata) and Milner (on regular behaviours and finite labelled transition systems), and includes many other systems such as Mealy and Moore machines. Silva, A.M, Bonsangue, M.M, & Rutten, J.J.M.M. (2010). 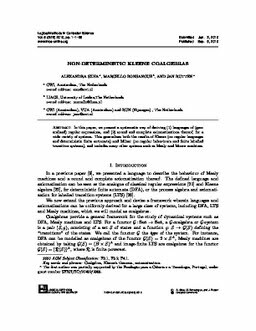 Non-deterministic Kleene coalgebras. Logical Methods in Computer Science.